At a breakfast with African American pastors here, Democratic gubernatorial hopeful Richard Cordray answered question after question about the “A” rating he got from the National Rifle Association when he was attorney general. But his answer on weapons like AR-15s raised eyebrows. A half-mile away stood a billboard from the campaign of opponent Dennis Kucinich, who touts his own “F” rating from the NRA: “Protect Our Kids. Ban Assault Weapons” is its starker message. Throughout the country, increasingly contentious primaries for governor are emerging as central battlegrounds in the broader struggle for the soul of the Democratic Party. While House and Senate primaries have focused on electability and the goal of winning the two chambers, these state-level races are home to debates on a range of core policy questions on guns, education, health care, the economy and marijuana legalization. And unlike congressional races, where the parties’ campaign committees have intervened in primaries, there’s no national group that takes sides in choosing the nominee. In many cases, establishment candidates and incumbents are being pulled to the left by an energized party base and surprisingly strong liberal challengers. In New York, actor and activist Cynthia Nixon has mounted a credible challenge to Gov. Andrew Cuomo by arguing that he seems to “work for the Republicans” rather than govern as a Democrat. Cuomo has responded by moving to restore voting rights for parolees and signaling openness to marijuana legalization. In Florida, where Democrats haven’t won a governor’s race since 1994, the three leading candidates spent much of a televised debate last week debating their liberal bona fides. Former congresswoman Gwen Graham, who spent her one term crafting a moderate record, defended herself against accusations that she didn’t vote closely enough with President Barack Obama. Tallahassee Mayor Andrew Gillum and former Miami Beach mayor Philip Levine discussed how they would move the state to the left. In Michigan, a wealthy entrepreneur entered the race and branded himself “the most progressive Democrat” on the ballot, backing statewide single-payer health care and a $15 minimum wage. Shri Thanedar now is ahead in polling and name recognition over former state senator Gretchen Whitmer, the clear favorite of party leaders and labor unions. Colorado has a crowded field, with a congressman, former state treasurer and lieutenant governor all in the race. There, candidates aren’t battling over whether to provide universal health care but how to do it. In similar fights last year in New Jersey and Virginia, the Democratic Party’s preferred candidates in gubernatorial races prevailed against challenges by insurgents from the left. In both cases, Democrats went on to handily best the GOP candidate. Liberal candidates have suggested that their states can become laboratories for left-wing policy and bulwarks against Trump policy and. The wide-open primaries have shown how candidates from the left can energize the party’s restive base, and the races have previewed fights in what looks to be a large field of candidates for the party’s presidential nominee in 2020. In Ohio, Cordray tried to run on “kitchen table issues,” rolling out policies like free in-state tuition for some colleges, and arguing that it was pointless to run on gun-control policies that would die in the state legislature. His campaign centered on his work at the Consumer Finance Protection Bureau, which he led from 2012 until his decision to enter the race last year. The pitch was simple: He wasn’t flashy, but he had spent years getting justice for consumers. Sen. Elizabeth Warren (D-Mass. ), who first proposed the CFPB that Cordray led, came this month to Ohio to campaign for “my friend Rich.” Warren, a frequent target of President Trump, stayed away from red-meat issues and helped Cordray release a policy to combat opioid addiction. Cordray’s style has also been a challenge with some voters. On Sunday, the Cleveland Plain-Dealer endorsed Kucinich as the candidate “most likely to challenge Statehouse inertia,” praising his style over Cordray’s laconic search for compromise. Cordray’s backers readily concede that their candidate is not much of a back-slapper. “Let’s just face it: Rich is a nerd,” Warren said in an interview before heading to Ohio. But while local and national Democrats had viewed Cordray as their strongest possible candidate for governor in Ohio, Kucinich argued that “the establishment” had selected a dud when the state wanted a bold shift to the left. Kucinich has been backed by Our Revolution, the political group founded by Sen. Bernie Sanders (I-Vt.) to promote “progressive” candidates. Sanders has pledged to stay out of the race. 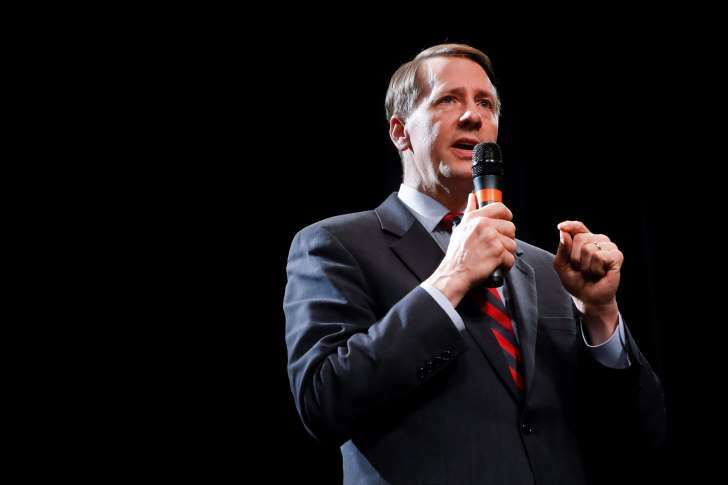 Kucinich has created openings for Cordray whenever the topic veered from core issues. At an early April town hall, he startled one supporter by saying that it should be “up to parents” whether children received vaccinations; when pressed, he said that the science was not settled. Two weeks ago, Cordray’s campaign attacked Kucinich for not revealing a $20,000 honorarium from a Syrian lobbying group — with “ties to the so-called 9/11 Truther movement,” as former governor Ted Strickland (D) put it. Kucinich fought back, saying that the “cowardly, hysterical and outrageously untrue statements” reflected a panic among “State Capitol power-brokers” about his candidacy. But after a week of brutal attacks, amid early voting, Kucinich returned the money. “There I am!” said Cordray.